Retreat of Svenbreen, Dickson Land, Svalbard, over the period 2007-2017. Photo: J. Małecki, Adam Mickiewicz University Polar Station (AMUPS). Despite recent records of climate warming, the extensive ice caps and ice fields in Svalbard, one of the largest repositories of arctic glaciers, have been melting at a relatively modest rate. The smaller glaciers, however, are much more sensitive to temperature increase, and their future is under a serious threat. Central part of Spitsbergen, the largest island of the region, suffers from dry climate, so it is dominated by only small glaciers similar to those found e.g. in the Alps or New Zealand. These small ice masses were previously known to melt faster than their bigger counterparts, but only a few of those have been thoroughly researched to date. The new study published in The Cryosphere journal investigates the small glaciers’ response to climate change in the heart of Spitsbergen, in arid Dickson Land, to highlight their ever-increasing rate of decay since early 20th century. The research used old maps and digital terrain models from previous aerial photography surveys to investigate changing thickness of glaciers over three periods: 1900-1960s, 1960s-1990 and 1990-2011. ‚Healthy’ glaciers gain mass during winter snowfalls and lose a comparable amount of ice during the subsequent summer, so their net mass does not change much over longer time period. When one of those mass balance components decreases due to climate change, winter snow accumulation is not enough to replace the summer ice melt. The glacier starts to shrink and retreat its front up valley. Location of the study area, Dickson Land, in Svalbard. Source: Małecki (2016), The Cryosphere, CC-BY-3.0. Dickson Land is located ca. 100 km from the moisture-carrying seas, making it one of the least glacier-covered regions of Spitsbergen. The new study counted there ca. 150 glaciers and ice patches, covering at present 200 km2, or only 14 % of the region. But just 100 years ago their area was by 130 km2 larger. The reason for this strong change is the increasing summer air temperature over Svalbard, which has been continuously boosting summer melt processes. As a result of climate warming, the annual rate of glacier area loss has quadrupled, and front retreat rates tripled since the beginning of the study period. Over the last two decades local glaciers have been shortening on average by 16 m every year, but those with low-lying fronts have been experiencing even faster decay, on the order of 50 m or more. For short glaciers, such as those in Dickson Land (typically 1-3 km long), that means a lot, so front retreat was the main cause for fast ice area reduction in the region, on average by 2 km2 every year over the last five decades. Retreat of Ferdinandbreen, Dickson Land, Svalbard. Photo: J. Małecki, Adam Mickiewicz University Polar Station (AMUPS). The most striking evidence for the poor state of local ice masses was revealed by measurement of their post-1990 thickness changes. It turned out that all glaciers have been reducing ice thickness very fast in their lowest zones (by 1-3 m/year), with spatially-averaged mean of 0.7 m/year, being among the most negative figures in all Svalbard. But the really bad news came from the highest elevations of Dickson Land, where ice thinning has been noted as well. This observation suggests a big shift in the regional mass balance regime, because upper glacier areas originally used to serve as snow accumulation fields, where new ice could be formed. With only thinning going on there, there is a good chance that many glaciers in central Spitsbergen, particularly those at low elevations, will disappear within the next decades, even if the climate warming stops tomorrow. 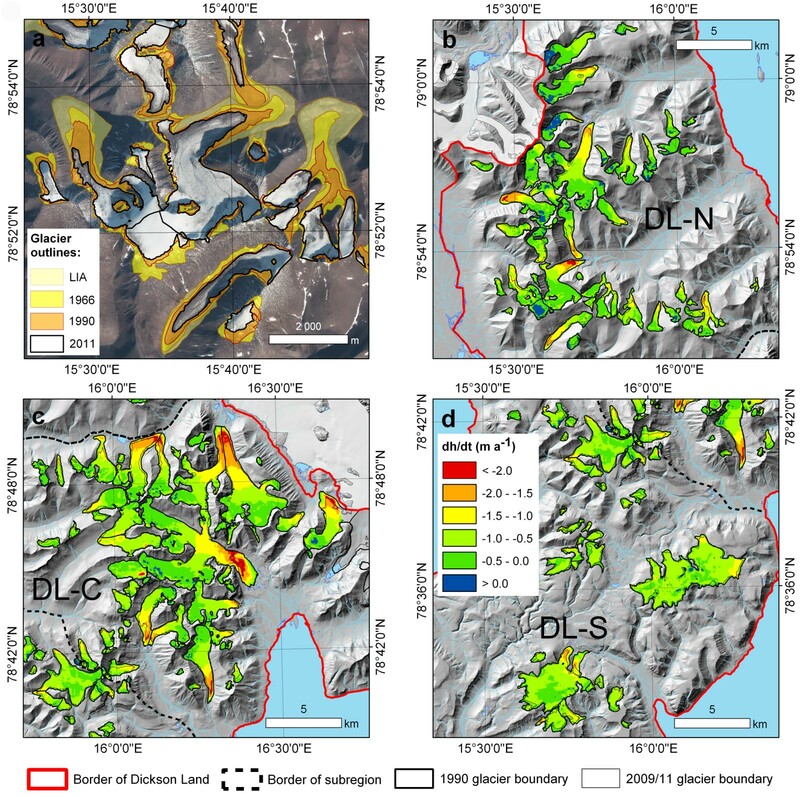 An example of glacier area changes in northern Dickson Land (a), the mean 1990–2009/11 elevation change rates in northern (b), central (c) and southern (d) Dickson Land. Red – fast thinning (>2 m/year); blue – thickenning. Orthophotomap background for (a): ©Norwegian Polar Institute. Source: Małecki (2016), The Cryosphere, CC-BY-3.0. The decay of glaciers has a huge impact on local environments, i.a. on river discharge, radiation balance, ecology, or sediment transport and associated bathymetry pattern in the nearby fjords. Since the main settlements of Svalbard are all neighbouring similar glaciers to those in Dickson Land, the strong changes highlighted by the study may have a direct effect on the northernmost community in the world. On a global scale, one of the consequences of arctic ice melt is exposition of dark surfaces, which absorb a lot of solar radiation and further boost climate warming. Another fundamental consequence is the sea-level rise due to the increased meltwater delivery. Glaciers of Dickson Land contribute to this process ca. 150,000,000 tonnes of additional meltwater every summer. Małecki, J.: Accelerating retreat and high-elevation thinning of glaciers in central Spitsbergen, The Cryosphere, 10, 1317-1329, doi:10.5194/tc-10-1317-2016, 2016.